Nothing irks me more than charitable organizations which prey on the good will of people to gain contributions which does little more than enrich the officers and top employees of the charitable organization. Today I examine Goodwill Industries of Central Indiana, Inc. According to the company's 2008 tax return, $33,947,162 was spent on salaries and benefits for officers and employees. This was out of a total revenue of $58,142,665. Thus, over 58% of the revenue received by Goodwill Industries goes to income and benefits for officers and employees. That's not even counting other administrative expenses. James McClelland, President and CEO of Goodwill pulls down $393,990 according to the company's 2008 report. Other officers/top employees' compensation include Daniel J. Riley $199,240, Keith Reissaus $167,316, Kent Kramer $190,132, Cindy Graham $154,084, James Humphrey, $169,529, and Linda Brimmer $166,275. Goodwill Industries of Central Indiana has stashed away $20,800,485 in assets according to the company's 2008 tax return. According to Goodwill's mission statement, it is a "voluntary health and welfare organization" whose "overriding mission is to help adults prepare for, find and keep jobs and help young people prepare for life and work." Perhaps. But with Goodwill handing out that sort of compensation to their executive and top employees, I'm going to send my used clothing to my church instead of Goodwill. I would recommend others do the same. I hope this will be a regular feature on "Ogden on Politics." My goal is to highlight the work of a public official, regardless of party, who is fighting the fight for good government reform. In particular, I want to highlight those officials who stand up not for the lobbyists and big monied interests, but for the interests of average, everyday working men and women. The first recipient of the "Ogden on Politics" Public Official of the Month award is Senator Mike Delph. While I am no fan of Senator's Delph's immigration measures, when it comes to good government reform, Senator Delph bats a thousand. This week, Speaker Pat Bauer introduced a reform agenda for the 2010 legislative session. While I applaud Speaker Bauer for getting religion on government reform, we should never forget that Senator Delph was fighting for it long before it became a cause for insiders, like Bauer, House Minority Leader Brian Bosma, and Senate President Pro Tem David Long . They are all now clammoring to jump on the reform bandwagon. that Senator Delph has been driving for quite some time. He showed me a bill (Senate Bill 17) to require the reporting of every gift of $25 or more, including meals, that a lobbyist gives to a lawmaker. The current limit is $100; a reduction in that amount would make it harder for lawmakers to keep quiet about which interest groups are funding their dinners. Then he showed me a bill (Senate Bill 73) to require state university lobbyists, including presidents and trustees, to actually register as lobbyists. While it is crucial that we support and fund Indiana's universities, those institutions should have to abide by the same rules as other lobbying groups. Few groups work harder than universities to tap into the state budget. Is it too much to ask that those efforts be disclosed? to create a commission to fairly draw legislative districts. Senator Delph was true to his word and did introduce bills limiting legislative gifts and seeking to reform the redistricting process. In particular, Senator Delph insistence that the legislature draw fair legislative district lines, a reform that protects voters' rights but makes legislators who want safe, noncompetitive seats, unhappy, deserves praise. We need more legislators like Senator Delph. Thank you, Senator, for a job well done. In 1997, the City of Indianapolis allowed the Peace Learning Center, Inc. to set up shop in Eagle Creek Park, the municipal park located on the northwest side of Indianapolis. Recently, I spent some more time reading up about the Peace Center. Peace Learning Center (PLC) is an Indianapolis-based community educational institution promoting healthy learning, workplace and community environments. PLC establishes safe and common ways to address differences and promotes processes to help build community and healthy communication for youth, parents and professionals. Started in 1997 in Eagle Creek Park, PLC has reached more than 120,000 people locally and internationally. Our youth programs have been recognized by the Indianapolis Crime Prevention Task Force report as "a local 'best practice' that has demonstrated the effectiveness of teaching young adults and at-risk youth creative ways of resolving conflicts, personal responsibility, and character building." The task force recommends an expansion of PLC middle and high school programs, as well as more work in juvenile justice. After an extensive three-year research project, Indiana University’s Center for Urban and Multicultural Education has found that Peace Learning Center’s curriculum and programs are “researched-based best practices that are proven effective” (Crayton and Helfenbein, 2008). Like many non-profits corporations that receive our tax money, the Peace Center is heavily laden in administrative costs. On its 2008 tax return, it showed revenue of just more than $1.525,699. Salaries and benefits for the Peace Center amounted to $506,678, including the director, Tim Nation, whose salaries and benefits total in excess of $80,000. The organization has accumulated assets of $592,972. Travel expenses in 2008 are listed at a whopping $65,835, while seminar costs are listed at $7,733. Republican Councilor Ben Hunter is listed as a board member of the Peace Center. In a letter to the editor, Nation brags about the support of Mayor Greg Ballard and Parks Director Stuart Lowry. One has to wonder the wisdom of giving private non-profit corporations like the Peace Center grants so that they can pay themselves nice salaries while doing more expensively a mission that the Parks Department could be doing itself for much less. This morning has a brief letter from a Bill Downall responding to another letter written by John L. Sorg. I don't recall Sorg's letter but apparently he had pointed out that global temperatures have actually fallen since 1998. Downall claims the weather was an anomaly that year due to an El Nino. He then criticizes Sorg's approach at looking at only a ten year snapshot of the weather arguing that it is like saying the Colts are a terrible team if they haven't scored in the past five minutes. Of course Downall is correct, although his math is off. (Ten years in the 4.5 billion year history of a our planet is much less than five minutes of a sixty minute football game.) What Downall apparently doesn't realize though is that he is pointing out the very flaw in the science used by global warming alarmists. Whether it is ten years used by Sorg or the 114 years of recorded weather data used by those sounding the global warming alarm, both are tiny snapshots of our climate. The 4.5 billion year history of the planet has been dotted by ice ages and warming periods. In between those climate shifts are shorter-term zigs and zags in temperatures that last hundreds if not thousands of years. You can't just simply take a 10 year or a 114 year period of weather data, feed it into a computer, and extrapolate the data to reach conclusions about long-term weather patterns. The science of climatology has evolved to the the point where they can fairly accurately analyze weather pattern from millions if not billions of years ago. There is no reason to focus on just the recorded weather data which started being kept in the late 1800s, except that being selective about the data supports a political agenda. Let's have an open and honest debate about global warming, using all the climate data. Of course that may well disprove the global warming alarmists like former Vice-President Al Gore. Several Republican activists have complained to Councilor Ben Hunter about his votes on the council that more closely represent that of a liberal Democrat than a Republican. The latest is his sponsorship of a complete ban on smoking in public places in Marion County, a ban that would throw out the reasonable compromise reached a year ago on the subject. Prior to that, Hunter supported the first in what will be three tax increases to bail out the Capital Improvement Board. In fact, his vote made the difference in passing a measure to give Indianapolis the highest hotel/sales tax in the country. Not once did Hunter demand any sort of reform in the operation of the CIB in exchange for his vote. His answer was just to give throw more taxpayer money at the wasteful CIB, an organization which for ten years has been running a deficit. Instead of trying to placate his Republican critics, Hunter lashes out at them. While I have a strict policy of not publishing emails without approval, the same doesn't go for posts on Facebook which are for public consumption. Brian, came to your wall to let you know I am happy to meet with you upon your return. In response to your comments here, the only way I will be a "one termer" is if I don't run again. I think you know my district and my constituent service is one of the best on the council. There are no winners here. This debate was important for the up coming state session. You did not have to look far to see some state reps in our chambers last night. After it's all said and done, this public policy issue has wide support. My record is stronger on economic issues, more so than the one L on council. I'll be ok.
From what I've heard from other Republicans, that post is typical of Councilor Hunter's arrogance and condescending attitude when it comes to those who who dare criticize him. I don't know what fantasy world Councilor Hunter is living in, but he certainly does not have a strong record on economic issues. When we elect anti-freedom, tax and spend Republicans like Ben Hunter, we might as well elect Democrats. As far as his Irvington-area district goes, I know Republicans out there who are not at all happy having Ben Hunter as their councilor. I know a couple of them in fact who have much more political experience that Hunter, better state-wide political contacts, and nearly as much name identification. I don't know if they want to take time off from their families or careers to run in a primary, but if Mr. Ben Hunter thinks he would sail to re-nomination against either of them, he would be sadly mistaken. Councilor Hunter would be well-advised to drop the arrogant attitude and adopt a little more humility in how he conducts himself as an elected official. P.S. Councilor Hunter claimed that a colleague's reference to anti-smoking Nazis is an "anti-Semitic" comment. Trying figuring that one out. Today marks the third installment of my review of Marion County Sheriff Frank Anderson's use of the jail commissary fund. During my review of the last 2 1/2 years of expenditures, I ran across some interesting expenditures by the Sheriff. First the Sheriff likes to give out awards, though he apparently doesn't want to personally pay or budget for them. $9,441.93 was paid out of the commissary fund to Presenta Plaque Corporation for what is often labeled as "employee plaques," $909.83 was paid to Flying W Awards for "plaques, "awards," and a "retirement plaque." He paid The Trophy House $875 for an "award." Want to attend a nice fundraising dinner? No use shelling the money out of your own pocket when you can make the inmates pay the bill. The Sheriff paid $1,800 for the Center for Leadership Development for an "awards dinner" and a "minority achievers dinner." He paid $1500 to Crossroads of America Council for a table. The Sheriff paid Fairbanks Circle of Hope $2500 for a "sponsorship dinner" and then made two contributions of $1500 apiece from the commissary fund. $4,775 was paid to Julian Center, including $2,000 for a fundraising table and $1,500 to attend a "gala celebration." The Sheriff paid $2000 out of the commissary to attend three Fire Police Deputy Sheriff's luncheons. He paid $2,100 to the Greater Indianapolis Progress Committee for "luncheon tables." Indiana Black Expo received $8,600 out of the commissary fund for a luncheon and booth fees. The Indiana Black Legislative Caucus received $200 from the Sheriff's commissary fund for a fundraiser. The Sheriff's Association received $6,520 from the Sheriff's commissary fund for conference seminars and dues. $600 was paid from the commissary fund to the Indianapolis PAL Athletic Club for a "table of ten dinner." $1000 was spent out of the commissary fund for the "Special Olympics Torch Run." $350 was paid to the "Ancient Order of Hiberians" for two newspaper ads. Some interesting non-charitable expenditures: $120.96 to Long Bakery for "APC Event Donuts," $1,350 to the Marion County Prosecutor's Office for "criminal code books" and my personal favorite, $3,330 paid out of the inmate's commissary fund for "ammunition." All of these expenditures might be well be legitimate and, with regard to the charitable expenditures, commendable. But the problem is that most if not all are not expenditures that can be legally made out of the commissary fund under IC 36-8-10-21. The expenditures need to be properly budgeted. As far as the charitable causes, it would not hurt our Sheriff, who occupies one of the most lucrative offices in the State of Indiana and whose pay is in the hundreds of thousands, to pay charitable expenses out of his own pocket rather than from the inmate commissary fund. Lobbyists will be required to report any gift of more than $50 to a legislator, legislative candidate or legislative employee. An individual who holds a state elected office may not be registered as a lobbyist for one year after leaving office. Lobbyists will be prohibited from representing multiple clients if there is a conflict of interest between those clients. Any individual appointed to a position in the executive branch by the governor will not be allowed to register as a lobbyist for one year after leaving the post. Committees representing the governor or any candidate for that office will be prohibited from soliciting contributions or conducting fund-raisers during the long session of the Indiana General Assembly or a time period around the Legislature’s Organizational Day.“The proposed changes mirror what we are seeking in the legislative branch, and expand a prohibition on raising funds that has been in effect in the Indiana House for a number of years,” Bauer said. People who have contracts with state government or bid on contracts will be prohibited from making political contributions to individuals who hold state office or run for state office. People who bid on or receive contracts will be required to register with the state’s election division, which will make that information available to the public. Violators will receive civil and criminal penalties and face the potential loss of their state contracts. The Indianapolis Star reported that other legislative leaders, including Republicans House Minority Leader Brian Bosma and Senate Majority Leader David Long expressed support for an ethics reform agenda. The Star also noted the reaction of Sen. Mike Delph, a Carmel Republican who has pushed for a major overhaul of lobbying rules. Sen. Delph called the backing by legislative leaders "a good day for Indiana." He stated further: "This is a step in the right direction in terms of rebuilding the public trust and fomenting the idea that government is accountable to the citizens and the constituents that elect their representatives." Critics of Speaker Bauer saying he is just pushing a reform agenda for "political reasons." To that, I would reply, "so what?" I have long said that pursuing a reform agenda is politically popular. Speaker Bauer has apparently woken up to that fact. Who cares about his motivation for pushing reform, if reform gets enacted? It is a shame that Marion County Republican leadership and the Ballard administration have not gotten the message about the popularity of an ethics/good government agenda. Reviewing the Mayor's contribution report is like reading a "Who's Who" of what companies are doing business with the City. If Republicans do not stand for good government reform in Indianapolis, an agenda the Marion County Democratic Party here has avoided, they are doomed to be the minority party in the county. It was the game of my youth. I grew up in Madison, located in southeast Indiana. 90 miles down the river the Big Red Machine played. The Reds first baseman ,Cuban-born Tony Perez, was my favorite player. He followed other Reds, catcher Johnny Bench and second baseman Joe Morgan, to the Hall of Fame in Cooperstown, which I refuse to set foot in until Pete Rose the Reds player (not the gambling Reds manager) who has more hits than anyone in the 130 plus year history of the game, is inducted. But I digress from my intended topic. Today, October 28, 2009, marks the start of the 2009 World Series. It should be a happy time watching the hated Yankees lose to the Phillies in the Fall Classic. It is not. Baseball executives are killing my sport. Let me explain. For anyone who has played (as I have) or watched the game, baseball is a wonderful summertime game. One of the best experiences in the City is knocking off work early and attending a day game at Victory Field. But when the temperatures plunge toward freezing, the national pastime becomes a miserable experience both for players and fans. Tonight, the first pitch in the Bronx will be thrown about 8 p.m. These post-season games tend to last much longer than the regular season, I expect it to be nearly midnight and in the 40s before the game ends, a cold, rainy miserable evening in New York City. The Classic 1975 World Series involving the Reds and Red Sox began on October 11th and was over well before the NBA season started. This year's World Series starts 17 days later and will go several days into November, crossing the start of the NBA regular season. Back then many playoff games were during the day, something you rarely see anymore. I still remember in my youth seeing then Commissioner Bowie Kuhn attending one of the then infrequent playoff night games, refusing to wear an overcoat because he did not want to admit it was too cold for baseball. My how times have changed. The time of the games leads to a second problem. To become a fan of baseball, you have to grow up watching the sport. Starting playoff games at 8 pm almost assures that the possible future fans of the sport will be in bed long before the games are concluded. It is hard to build a following among the youth when you make the most important games of the season inaccessible to them. Baseball executives have sacrificed the future young fans of the game to start games when the maximum number of adults would see them, i.e. prime time. It is a short-sighted decision that is haunting Major League Baseball as the sport continues to decline in popularity. Recently the Indianapolis Star did an article on "minors" being served alcohol in the Indianapolis area. Today the Star did an editorial supporting the use of 18-20 year olds in sting operations. You'll notice that I put the word "minors" in quotes. The reason why is that only in the area of alcohol consumption does the law consider someone 18 and older a "minor." In other area of the law, an 18 year old has all the privileges and responsibilities of being an adult exactly because an 18 year old is considered an adult. At some point in this country we need to realize that alcohol prohibition for those 18-20 year olds does not work, has never worked, and will never work. In fact the reason why we have so much trouble with binge drinking and driving while intoxicated in this country is precisely because the United States, unlike other countries, refuses to address alcohol consumption in a realistic manner and reasonable manner. We should be teaching 18-20 year olds to consume alcohol responsibly, not pretending we can somehow enforce prohibition for that adult age group. It's an old argument but one that is precisely on point. How can we send 18-20 year olds overseas to possibly get their heads shot off, but tell those same youth that if they drink a beer they deserve to get thrown in the jail? What Happened to the Indianapolis' Smoking Ban Compromise? I grew up around a smoker, my father, who paid the price when he died of lung cancer at 51. I was 14 at the time. I firmly believe that government should not be interfering with the decisions of private business owners. I know the argument that government already can regulate those businesses. The argument that this should allow government to also regulate whether those private businesses also allow smoking is the camel's nose under the tent. It would open the door to endless regulation. Next stop is those fatty, high caloric meals served by fast food restaurants. This is not about smokers' rights versus non-smokers' rights. Neither smokers or non-smokers have some sort of "right" to be in a private business establishment or to be free from smoke in that business establishment. This issue is completely about property rights and the extent that we want government interfering with those rights. Nor am I moved by those who claim that a smoking ban is good for business. I am confident in leaving the determination of what is "good for business" to the hard working men and women who have actually invested their money in the business venture. I thought we reached a reasonable compromise on this issue last year. Smoking would not be permitted in any establishment that serves minors. Protecting minors from the dangers of second-hand smoke is a legitimate government interest, one that might justify limited interference with property rights. Adults, unlike children, have the choice whether to patronize or work at the establishment. Now the smoking ban advocates are back trying to apply the ban to those places where only adults gather. So much for the reasonable compromise. Recently I reviewed Marion County Sheriff Frank Anderson's Commissary expenditures for 2007, 2008 and 2009. Earlier I reported that he had paid his law firm Locke Reynolds, which has now merged into Frost Brown Todd, nearly a half million dollars in attorneys fees out of the commissary fund in the last year alone. The Indianapolis Star reported in last October last year that Sheriff Anderson has been doing this for years and has paid his law firm more than $3 million dollars up until that point. These fees do not appear to be authorized IC 36-8-10-21 which details how commissary money can be spent. In reviewing the 2 1/2 years of commissary reports, I found other payments for professional fees that would not be authorized under IC 36-8-10-21. First, the The Beck Communications Group, Inc. has been paid a $2,500 monthly commission for "consulting services" out of the commissary fund the entire 2 1/2 years I reviewed. By my calculation, Beck Communications has been paid $82,500. Beck Communications, which was managed by Democrat activist Lara Beck who has done communication for Mayor Bart Peterson's administration, First Lady Maggie Kernan , and WellPoint. Beck Communications shows up in the Sheriff's 2006 end of the year campaign finance report as being paid more than $55,000 for work done for the Sheriff's campaign. Public and media relations strategies for clients in public and private sectors, as well as not-for-profit organizations. Also offer political consulting services.Beck Communications is listed as administratively dissolved by the Secretary of State as of last month. The issue is not whether the Beck Communications and London Witte expenditures, and even the legal fees, might have some merit. The issue is whether they are authorized expenditures from the commissary fund under IC 36-8-10-21. Contrary to how Sheriff Anderson has treated the jail commissary fund, it is not a fund that he can simply spend however he wants. None of us, including Sheriff Anderson, is above the law. The Sheriff needs to discontinue spending commissary money in violation of IC 36-8-10-21. If he can't bring himself to comply with Indiana law, he needs to consider resigning. I was interested in something Pat Andrews had posted over at "Had Enough Indy." Nowhere does the Resolution get any more clear than that. So, I Googled "Fed Ex Express HR 915". Turns out the FAA Reauthorization Act of 2009 would change the sweetheart deal Fed Ex has gotten for decades to be under the Railway Labor Act and not the National Labor Relations Act for the purposes of union organizing. See here for more detail. And the Fed Ex union view here. UPS is governed by the NLRA, by the way. Seems to me that any loss of jobs would be Fed Ex's doing. This is a wayward proposal that is deliberately weasel-worded to cover up its anti-organizing position. Prop 378 passed the Rules & Public Policy Committee on October 13 with a do-pass recommendation vote of 5-1. Those members present were Councillors Lutz (chair), Cockrum, Gray, Malone, Pfisterer, and Plowman. I can guess how they voted, but I do not know for sure. During the Committee meeting, Councillor Cockrum mentioned that he and Councillor Vaughn were approached by the head of the Indianapolis operations of Fed Ex to put forth this resolution that urges Senators Bayh and Lugar to vote against this provision of HR 915. Last month, the Council aided AT&T which had worked behind the process to out city telecom director Rick Maultra. Maulta, the chief city regulator of telecoms, had argued that telecoms should have to pay rights of way fees like they do in other cities and that AT&T in particular had violated telecom law. AT&T is not coincidentally represented by Barnes & Thornburg Partner Joe Loftus, who is also paid over $100,000 to lobby for the city and advise the Mayor. Although many Council members claim the vote had nothing to do with AT&T, the fact is AT&T representatives were making calls behind the scenes and attended council budget meetings where the elimination of Maultra's job was discussed. There is little doubt that Maultra's position would not have been eliminated had he not aggressively pushed measures that, although were beneficial to taxpayers and consumers, were harmful to AT&T. It does not take a rocket scientist to figure out which law firm represents FedEx. It is also Barnes & Thornburg. It is interesting that when FedEx wanted something done, the company went not just to President Bob Cockrum, but also to Councilor Ryan Vaughn who is an attorney for Barnes & Thornburg. Given the obvious conflict, Vaughn should not meet with representatives of the company and certainly should not vote on the resolution tonight. I do not know which side is right in this FedEx management-labor dispute. I do know, however, that our Council should not be used to to advance the interests of private companies. Although the FedEx resolution is not on the same level of the AT&T-inspired ouster of Maultra last month, it is nonetheless an example of the Council meddling in an issue it has no business being involved in. Take heart if you have been considering voting "NO" on the Wishard Referendum. Should the outcome be "NO", Health & Hospitals can continue forward and still build their new campus. The only thing that would change is that H&H would be banned from raising your property taxes to pay off the bonds. They have said all along that they can pay off the bonds with ongoing profits from Wishard. All they have to do is float revenue bonds. And, they could have floated revenue bonds without holding a referendum. Hold them to their promise not to raise your property taxes. Vote "NO" on the Wishard question. You will not be forcing them to live with burst pipes. You will not be forcing them to live without a new campus. You will only be forcing them to be true to their word - that they will not use property taxes to repay the bonds they use to finance the project. Republicans on the City-County Council appear ready to waste $500,000 in taxpayers' money for purely political purposes at the same time the city has been forced to cut funding for basic services. The council, controlled by its GOP members, included a half-million dollars in the 2010 city budget to redraw maps of political districts. Redistricting normally takes place after a Census is completed so that new maps better reflect population shifts. That can't happen next year, however, because new Census data won't be released until 2011. Which means council Republicans are preparing to draw maps based on information collected in the 2000 Census. Why the rush? State law blocks redistricting between November 2010 and November 2011, when the next election for council seats takes place. Republicans clearly are trying to push through district maps that are more favorable to them head of the 2011 election. And they're not even shy about it. Well, Democrats certainly aren't above resorting to rigging district maps to keep themselves in power. (Just look at the political games played in the Indiana Statehouse to understand that point.) But Cockrum is trying to rewrite the history of the most recent redistricting fight in Marion County. In 2003, the Republican majority approved new district boundaries. After the plan was rejected by Democratic Mayor Bart Peterson, the dispute landed in the Indiana Supreme Court, which declared the Republican map to be too partisan. The court then drew its own map, which is still in effect. The 2003 election featured closely contested races among well-qualified candidates in several districts. Democrats gained control of the council for the first time. The next election, in 2007, brought a reversal -- with Republicans regaining the majority. Two elections. Two close results. Two parties alternating power. The system it would seem has worked as intended. Council Republicans, however, are now trying to protect their turf through power politics. If they proceed, it would be not only a cynical waste of taxpayers' money but also an abuse of voters' trust. I couldn't agree more. Marion County Republicans are forfeiting their trust with the city's voters if they go down this cynical, political road. Republicans need to be the party of reform, the party of good government if they want to win in 2011. Unfortunately that's not the direction most of the party's elected officials have been moving in. My question to the Star's editorial board, however, is to ask why the Star isconcerned about fairness when it comes to the 2011 election, but seems to have no concern whatsoever about election fairness when it comes to the Wishard referendum election. Health & Hospital managed to sneak in a provision in the budget bill that allows Wishard advocates to avoid putting into the referendum question how much money HH would be borrowing and that the money would be used to build a new hospital. The Star says nothing. Public resources, including the City's email system, has been used to promote the referendum. The Star has said nothing. Health & Hospital misleads people about the funding for the new hospital. The Star says nothing. The Star is rightly concerned about the wasted $500,000 for an early redistricting, but seems not at all concerned about the over $1 million taxpayers will have to pay for this unnecessary referendum in an off-year. The Star should be insisting on good government and election fairness across the board. Instead the editors have taken a selective approach. If it's for a good cause, i.e. a new county hospital, the Star is willing to overlook dishonest, underhanded tactics designed that misuse public resources and mislead voters. Two situations involving Indianapolis City-County Councilors is being discussed on the blogs. Over at Advance Indiana, Gary Welsh discusses the arrest of Republican at-large member Kent Smith's 18 year old son on a charge of bringing a knife to school. Welsh questions whether it is newsworthy. I feel at best it is a story that deserves about a line or two buried in the Indianapolis Star. For the television stations to give it sort of coverage it did is way overblown. Kent Smith is not responsible for the alleged misdeeds of his adult son. Over at Indiana Barrister, Abdul complains of the "ghettoish behavior" of Democratic Councilor Doris Minton-McNeil who represents a district on the near northwest side. According to Abdul, Ms. Minton-McNeil was involved in another neighborhood incident where she was supposedly intoxicated and cursing. I think any way you slice it Abdul's complaint of her "ghettoish behavior" has a certain racial tinge to it. I certainly don't think Abdul by making that comment is a racist any more than a Rush Limbaugh is a racist for the comments he made. But it is the type of comment one should avoid in an era of heightened racial sensitivities. Like it or not, that's the world we live in. I refuse to pile on Councilor Minton-McNeil. If she has a problem with alcohol, then we should all wish that she get help. If she is unwilling to get help or rehabilitation will take too long, then she needs to resign her seat so her district is properly represented. There is no need to kick her when she is down. Let's all hope she gets better regardless of whether she remains a councilor. I should hope that none of our lives are ultimately judged by our worst moments, because then we are all in a lot of trouble with our Maker. I am far more worried about having a more honest, ethical and accountable government, in particular one that serves the needs of the public and not the wishes of the elites trying to profit off of the taxpayers. If readers haven't noticed, we do not have that in this City. I have been critical of both parties. We have Mayor Ballard, a Republican elected as a reformer, whose administration seems to be completely hijacked by self-interested insiders who are trying to make as much money as they can during Ballard's four years in office, a mission that is directly contrary to the future success of my Republican Party in Marion County. I likewise recently complained about Republican Rep. Buyer's 501(c)(3) scholarship organization that has existed for six years or so and not handed out a single scholarship, but seems to do nothing more than sponsor lavish golf fundraisers at exotic locales. On the Democratic side I have complained about the failure of Sheriff Frank Anderson to do the job to which he was elected and his misuse of the jail commissary fund. Likewise I also complained about possible ghost employment involving Councilor Monroe Gray and the fire department and how I believe our prosecutor should have looked into that. I also exposed a Democrat, John Dillon, for having made hundreds of thousands of dollars on a part-time consulting contract he received from the Indianapolis Bond Bank while at the same time Dillon served as President of the Bond Bank. While we should not overlook the alleged misdeeds of Councilor Minton-McNeil, those misdeeds have to be kept in prooper context. Her alleged misbehavior is in a totally different class than the kind of conduct that deeply affects whether the City has a more honest, ethical, and accountable government. Obsessing on whether Councilor Minton-McNeil was intoxicated and/or cursing, detracts from the mission of cleaning up Indianapolis government. That is where the focus needs to be. Today, begins a series of articles discussing how Marion County Sheriff Frank Anderson has repeatedly violated IC 36-8-10-21 in his handling of the inmate commissary money. I obtained a copy of the report on receipts and expenditures from the Sheriff's Commissary Fund. These articles are based on that report. (9) any other purpose that benefits the sheriff's department that is mutually agreed upon by the county fiscal body and the county sheriff. Money disbursed from the fund under this subsection must be supplemental or in addition to, rather than a replacement for, regular appropriations made to carry out the purposes listed in subdivisions (1) through (8). During a council meeting a few months ago, I tried to raise questions regarding the spending of commissary money and a questionable budget item authorizing the Sheriff to pay Corrections Corporation of America, the private company that runs Jail #2, several million dollars for an alleged arrearage. The Sheriff's council, Kevin Murray, stood by me during the meeting and continually interrupted me, falsely suggesting I was somehow using the committee meeting to collect information on a pending lawsuit. If anyone wants to know why Murray was doing what he's doing, it is because I was trying to ask questions about two very sensitive topics: 1) the Sheriff's expenditures from the commissary fund (which not coincidentally went to Murray's law firm); and 2) the Sheriff's highly questionable payments to CCA. Contrary to what Sheriff Frank Anderson apparently thinks, the commissary fund does not exist simply for him to spend as he pleases. There is a law that needs to be followed, a law which the Sheriff has for years ignored. In the days that lie ahead, I will provide additional articles exposing Sheriff Anderson's misuse of the jail commissary fund. The BFC award recognizes Indianapolis's commitment to improving conditions for bicycling and its practice of making a focused investment in bicycling programs and facilities. The BFC judges were particularly impressed with the city's quick turnaround time in adding its first on-street bike lanes and with its comprehensive plan to construct at least 200 miles of on-street bike lanes throughout the city. I am a bicyclist. From April through October, I ride my bike 2-3 days a week into the law office downtown. I ride on those "on-streek bike lanes" (on Michigan and New York streets) referenced in the press release. I really think the Mayor was trying with the creation of those bike lanes, but the fact is they are extremely dangerous. They run between traffic at points, cross lanes at other points, and run right next to parked cars, a situation any experienced biker will tell you is extremely hazardous because of car doors being opened by people who may well not see a biker over their shoulder or in the rear view mirror. I have also seen countless people driving with wheels in the bike lanes. In addition, much of the pavement in the bike lanes is broken and you have to dodge the occasional pot hole. Being confined to the narrow lane with traffic all around makes it difficult to manuever out of the way of those hazards. Indianapolis downtown streets have always been extremely easy and safe to ride on. The lanes in most places are extremely wide and a halfway decent bicyclist can pretty much keep up with traffic. Adding the bike lanes narrow the car lanes (and indeed takes lanes away at some points) confining traffic into a smaller area. It is actually a less safe situation for the drivers of the cars and the bikers in the bike lane. The Mayor deserves an "A" for effort on the bike lanes. But an award for being a Bicycle Friendly Community because of those unsafe bike lanes? No. Today's Indianapolis Star brings complaints from state legislators about the remaining Family & Social Services Administration privatization partner, Affiliated Computer Services. While Governor Daniels has dispensed with IBM and its role in the privatization effort, ACS remains. The two legislators, Peggy Welch (D-Bloomington) and Suzanne Crouch (R-Evansville), suggest it is time to end ACS's role as well and and that that company's performance as as bad as IBM. Rep. Crouch goes even further, noting that people were uncomfortable with the fact that former FSSA director Mitch Roob had previously worked at ACS before the privatization effort. Early last year, Rep. Crouch and fellow Evansville Republican Vanetta Becker led the charge against the roll out of the FSSA privatization, suggesting that Governor Mitch Daniels put a halt to the it until problems could be studied. Governor Daniels lashed out against the two Republicans, suggesting they were being disloyal. Rep. Crouch and Rep. Becker stuck to their guns and were proved correct. Let's not forgot that this all happened just a couple months after the Governor had overwhelming won re-election. Rep. Crouch and Rep. Becker demonstrated legislative leadership. They stood up and asked tough questions and demanded answers, even when the target was something going on in an administration controlled by their own party. It is a lesson that Indianapolis City-County council members should heed. Republicans on the Council are too often little more than a rubber-stamp for the Republican Ballard administration, even when faced with dubious administration policies and projects that jeopardize taxpayers. Even Democratic council members seem unable to formulate tough questions, even when those questions are obvious and need to be asked. Attending council meetings, one sees an unfailing politeness toward those officials who come before the council, which politeness means not asking questions that might goes much beyond the official's presentation. Inevitably, that presentation ends with council members praising the official for being open and candid, even though the council members were simply accepting as true whatever the official was spoon feeding them. I have long preached the need for the Indianapolis City-County Council to play a more active role. The Council acts as a necessary check on the administration, regardless of whether the 25th floor is occupied by a Republican or Democrat. Not only has the Council not played that role during the last few decades, but the Council has time and time again willingly allowed the administration to bypass the Council's role in approving various projects. The time is long past due for the Indianapolis City-County Council to reassert its role in governing Indianapolis. This afternoon, the city’s Office of Enterprise Development released a Request for Information and Qualifications in conjunction with the Capital Improvement Board, soliciting proposals for private-sector operation and management of Lucas Oil Stadium and the Indiana Convention Center. The CIB, which manages the city’s professional sports facilities and the convention center, has struggled much of the past year to close a projected $47 million deficit for 2010. Last week, it said its financial situation has been improving, but still needs much work. According to the RFI, Indianapolis hopes to identify efficiencies and cost savings for each facility; build relationships with strategic partners; maximize their usage; evaluate potential economies of scale; and enter into a multi-year agreement with one or more respondents for their operation. The city’s deadline for responses is Tuesday, Nov. 24, at 4 p.m. After that, it anticipates issuing a formal request for proposals on Dec. 7, with an anticipated due date a month later. The RFI requires respondents to provide specifics about how their proposals to operate the three venues would affect major city events, such as Indianapolis Colts games, national swimming competitions, the Circle City Classic, events sponsored by Indiana Black Expo, NCAA events, events of the Indiana High School Athletic Association and various marching band events. It also notes that any respondent will be required to coordinate its plans with the Indianapolis Convention and Visitors Association in order to attract and retain significant public events and ensure the facilities are utilized at their full capacities. Whatever proposals the city receives, the RFI is careful to note that it cannot interfere with or jeopardize the tax-exempt status of bonds issued to underwrite construction of the three facilities. Unless they’re retired early, the Indiana Convention Center’s bonds reach maturity in June 2021; Conseco Fieldhouse’s reach maturity in 2027; and bonds for Lucas Oil Stadium and the convention center’s expansion reach maturity in 2041. Personally, I cringe at the privatization proposal. Even though we have given away all the revenue on Conseco Fieldhouse and most of it on Lucas Oil Stadium, let us not forget that those sports stadiums and the Convention Center are still public buildings, owned by the taxpayers. Putting a private company in charge of running those public buildings is to risk losing even more control over their operation. Further, this is Indianapolis, home of Hoosier pay-to-play politics. You know what is going to happen. A big political contributor is going to end up with a long-term contract to run the facilities. Along the way the company will have to hire a politically-connected law firm to do the paperwork and naturally "consultants" will also have to be hired to attend numerous meetings over the contract, of course at taxpayer expense. For just such an example, refer to my blog post about how the then President of the Bond Bank, John Dillon, was hired to be a consultant to the Bond Bank on the convention center project and pulled in over $354,000 on a part-time contract. Then you have the problem that the CIB has given away so much revenue on the Conseco and Lucas Oil Stadium contracts, that it would not be profitable for a private company to take over running those buildings. Thus, the contractor will also have to receive a big, fat taxpayer as part of the contract. Of course, this will be sold to the public as a "savings" over how much it costs the CIB to run the buildings. Then after a few years, we'll find that there has been no savings at all that the privatization contract costs taxpayers even more while making some politically-connected folks very wealthy. Privatization, which is about instilling free market competition into the delivery of services, is a terrific idea. Where privatization goes awry is when it becomes a form of patronage and contractors receive lengthy contracts that replace market competition, and the benefits that go along with it, with a government-sanctioned monopoly. That is undoubtedly the road the City would be going down should it carry forward with this privatization idea. Today's Indianapolis Star contains a nice article on Windsor Village an eastside neighborhood that was devastated by a mortgage fraud scheme masterminded by Robert Penn. It is an interesting story. Anyone who thinks that white collar crime like mortgage fraud does not have victims should read this and other stories about the mortgage scheme that inflicted such damage. What is only apparent from reading between the lines is that Mr. Penn was brought to justice not by state real estate regulators or the Marion County Prosecutor, but by the U.S. Attorney applying federal laws. The U.S. Attorney's Office generally won't get involved unless a fraudulent scheme is extensive and involves millions of dollars. Penn's scheme though fit the bill. Other mortgage fraud schemes slip under the radar because the feds simply are too busy to target anything but the most serious fraudulent schemes. When it comes to the players involved in a real estate transaction, Indiana offers a patchwork of regulation. The Secretary of State regulates mortgage brokers, the Department of Financial Institutions regulates lenders, the Attorney General's Office regulates appraisers and real estate agents, the Department of Insurance's Title Insurance Division, which I used to head, regulates title insurance agents. Any mortgage fraud scheme invariably involve multiple players and the multiple agencies who regulate them. Often the agencies are not on the same page regarding enforcement actions and communication between them is poor. Indiana desperately needs a unified regulatory effort for real estate. TheMarion County Prosecutor's Office also failed with respect to the Penn matter. Despite having information that should have led to prosecution of Penn, Brizzi's office failed to take action. While the Marion County Prosecutor should be criticized, the fact is other county prosecutors rarely prosecute mortgage fraud either. There is a fundamental reason why. A mortgage fraud scheme is highly complicated. It often takes a deep understanding of the complexities of real estate transaction to know what is going on. Very few deputy prosecutors have the kind of knowledge and experience that is necessary to prosecute mortgage fraud. Ideally a unified real estate regulatory body could offer prosecutorial assistance to those county prosecutors wanting to tackle mortgage fraud in their communities. With the assistance of an experienced real estate regulator, county prosecutors could more easily take on those whose criminal deeds are buried within complex mortgage fraud schemes that are simply over the head of a typical county prosecutor or his staff. In the meantime, the Attorney General is in a position to offer assistance to these county prosecutors. Unfortunately during the term of Steve Carter, the Attorney General's Office was the weak link in the state regulator change. Greg Zoeller, elected Attorney General in 2008, is showing signs that his office is going to be more active when it comes to real estate regulation. That is a welcome sign. Indiana desperately needs better real estate regulation and if the Zoeller leads the charge I will be his biggest fan. This morning's Indianapolis Star contains three separate Republican elected officials involved in alleged misdeeds. First up is Representative Steve Buyer. Now I would really like to defend Rep. Buyer given how much I like his voting record and leadership. But there is no excusing his role in the Frontier Foundation set up in 2003 to offer scholarship to needy students which has raised $883,272 but has yet to help a single student. Rather the whole foundation seems aimed at paying for golf raising fundraisers (FYI, in the fundraising world, golf outings are not generally considered great fundraisers due to their high cost) at lavish resorts. Buyer defends his role in the paper this morning while the Star editorializes that Buyer's charity needs to start acting, well, charitable. No matter how Rep. Buyer tries to spin it, there is no defense to a charity that raises nearly a million dollars and six years later has not spent a dime on helping students. Rep. Buyer showed bad judgment in the least. I would say, however, that Buyer's foundation is not the only such organization out there. The big scandal out there awaiting the IRS is how non-profits have used their status to bestow benefits and cushy salaries on officers and employees while doing little if anything to advance the cause for which the non-profit was established in the first place. Next I turn my attention to Carmel and my least favorite Republican Mayor, the big-spending, big-borrowing Jim Brainard. Last night the Carmel Mayor and the city's engineer escaped a reprimand by the Council. The Mayor had purchased a piece of property worth more than $100,000, without council approval. State law requires that there be council approval for the purchase of any property valued over $25,000. The votes fell short 3-4 on the reprimand because the councilors voting against it just concluded that the Mayor just made a "mistake" and no further reprimand was needed. Wow, I'd like to have those four councilors who voted "No" on a jury should I ever be prosecuted in Hamilton County. The fact is the $25,000 rule is extremely well-known. Mayor Brainard is in his fourth term. There is no way he did not know about it when he authorized the purchase of the $100,000 plus piece of property. He deliberately violated state law. There is no excuse. A public reprimand was the least that should have been done. Finally my attention turns to Southport Mayor Robin Thoman. 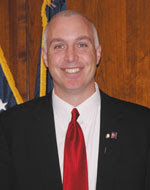 Mayor Thoman has been asked to resign by a unanimous vote of the Southport City Council. Mayor Thoman refused. The Council has authorized a fraud investigator to look at the city's financial records. Like Mayor Brainard, the allegations are that Mayor Thoman did things behind the back of the the city's legislative body. Complaints out of Southport are that Thoman has spent tens if not hundreds of thousands of dollars on politically-connected lawyers and law firms while laying off Southport's police force. Council members complain that other expenditures have been made without their knowledge and approval and that they have had difficulty getting information from the City. There are also allegations that Mayor Thoman hid a criminal record when running for office and on his application for a dental license. I met Mayor Thoman within the first few days of his taking office. I thought he was going to be an "outsider" someone who would disdain the typical practice of mayors hiring hiring politically connected law firms which bilk taxpayers for hundreds of thousands of dollars in inflated legal fees, while kicking back some of that taxpayer money in the form of political contributions and support. My judgment proved poor. Mayor Thoman almost immediately upon taking office began playing the insider game, hiring Barnes & Thornburg and the GOP county chairman Tom John, also an attorney. Complaints out of Southport is that the bills of Mayor Thoman's politically connected attorneys have practically broken city finances. When I started this blog, I vowed to call them like I see them. When a fellow Republican is out of line, he or she doesn't get a pass because of that person's political affiliation. I don't believe in moral relativism...that conduct of a Democrat that is wrong is somehow right if that conduct is done by a Republican. These three Republicans have committed wrongs and need to be called out by both Democrats AND Republicans. This Republican is doing just that. This weekend I had a chance to watch a show debunking the conspiracy claims that the 9/11 tragedy was actually the work of our own government for the purpoe of luring the country into a war in Iraq. Let's forget for a second that 9/11 was actually the rationale for going into Afghanistan and not Iraq (which came months later and was based primarily on the claim Saddam Hussein had weapons of mass destruction), such a conspiracy would require the enlistment of tens of thousands of Americans in a conspiracy that killed thousands of their fellow citizens, a conspiracy in which everyone involved agreed to remain silent about it. The documentary refutes one by one all of the outlandish 9/11 conspiracy claims. I bring this up because one blogger, whose name rhymes with "Raoul," likes to regularly deride other bloggers as believing in conspiracies whenever they (including me) question the accuracy of something that is told by government and other sources. He is doing nothing less than trying to discredit us by putting us in the same camp as those who think that 9/11 was orchestrated by the Bush administration. The most recent charge of conspiracy deals with the news report regarding the sudden emergence of the Capital Improvement Board into the black, where the Board now claims that, by laying off some low level employees, cutting cell phone bills and lowering the thermostat this summer, it has saved tens of millions of dollars and now can offer the Indiana Pacers a subsidy by picking up at least some of the operating costs at Conseco Fieldhouse. Gary Welsh of "Advance Indiana," Pat Andrews of "Had Enough Indy" and myself all questioned the CIB numbers on our blogs. Although he did not mention us by name directly, "Raoul's" derision was clearly aimed at us as we were labeled as believing in a conspiracy for not accepting the CIB's story. He further assures us that, if the CIB or City officials agree to send some money to the Pacers, they will get something for the taxpayers back in return. This morning I thought of the difference between the 9/11 conspiracy theorists and the bloggers who question the CIB. The difference is between making up dots and connecting the dots. We bloggers have simply connected the CIB dots that exist. We are not creating them out of whole cloth like the 9/11 conspiracists do. The fact is CIB has continually changed their numbers, which is what legislators have complained about.. The fact is that CIB's cuts would never have produced over $20 million in savings as claimed by the CIB. The fact is there is simply no reason under the contract to give the Pacers anything...all the triggering events to exercise the option to cancel the contract (moving, selling the team and not making enough money) have not happened plus the contractual penalties would be too severe for the Pacers to ever contemplate paying. Additional facts are that the CIB has never taken a vote on giving the Pacers more money. Bob Grand, is President of the CIB and represents the Pacers and the owners of the Pacers, the Simons, another fact. The only place I have heard a claim that the City would recover money from the Pacers in exchange for picking up the operating costs at Conseco Fieldhouse was while appearing on "Raoul's" radio show. While there he told me the deal would be that the City would get non-basketball revenue at Conseco for picking up the operating costs. That's a fine claim butthe fact is not a single administration, CIB, or Pacer official has ever suggested that in exchange for the CIB, i.e. the taxpayers, picking up the operating costs at Conseco, the Pacers would forego the non-basketball revenue from the facility. Connecting dots, i.e. facts in blogs is nothing more than reaching logical conclusions based on a set of FACTS. That is not the same thing as believing in a "conspiracy." Health and Hospital Corporation is basing its "no tax claim" completely on an assertion that its nursing home income stream can support the new hospital without tax increases. That is based on a Medicaid reimbursement practice that Mitch Roob, a former CEO of HHC, has labeled a "scam" and who suggested will be cracked down on by the feds. If this income stream does not continue for the next 30 years, taxpayers are on the hook, a fact the Star continually ignores. It is almost certain the Feds will crack down or the Medicaid refunding formula will change during the next 30 years, leaving taxpayers on the hook. Nonetheless, the pledge of no increase in taxes is solely backed by an unenforceable promise by HHC. The Star claims that general obligations bonds backed by property taxes are being used because of the lower interest rate than bonds backed by HHC's income. Has the Star ever considered why that is? It is because, lenders do not believe that the HHC's Medicaid nursing home scam can be maintained for 30 years. Those lenders do not want to assume the risk that the feds are going to put a stop to it. Instead the Star is endorsing that taxpayers assume a risk that lenders do not want. The referendum was intentionally placed in a non-election year so that the new Wishard proponents could take advantage of low turnout which will favor their side. This referendum could have easily been held during a regular election. Instead having it, in a non-election year, will cost taxpayers over a million dollars, a fact the Star continues to ignore. Likewise the Star ignores the fact that HHC representatives were allowed to write a referendum question that does not mention they would be building a new hospital and does not mention how much money they could borrow. The Star's silence on these points endorse a dishonest referenda practice that will undoubtedly spread to other public questions. The Star claims to be for "good government" like lobbying and redistricting reform, but that apparently honesty and full disclosure take a back seat when it is for a "good cause." Shouldn't voters have before them how much is being borrowed and what the money will be used for when they vote? The Star suggests in its editorial today that that is simply not important. Mayor Ballard used the city's email to promote a "Yes" vote on the Wishard referendum. That is clearly a violation of city ethics rules, if not Indiana law. IUPUI Chancellor Bantz used the university website and university's email system to also promote a "Yes" vote. The Wishard folks are using government resources to promote their cause. Throughout it all, the Star has said nothing about the blatant misuse of public resources in support of the Wishard referendum. A recent financial report filed by the Wishard PAC showed incredibly only three individuals gave to the PAC, but two 501(c)(3) nonprofit corporations gave combined over a million dollars. The Star should be greatly disturbed by the fact that the Wishard PAC is undoubtedly using these nonprofits to hide their contributor list as well as to provide those individuals with tax deductions they are not otherwise entitled to by sending their contributions through a nonprofit before flowing to the Wishard PAC. The Star, by its silence on these tactics, is endorsing the worst abuse of our campaign laws which are intended to protect the right of the people to know. The message from the Star, through its last three editorials, is clear. The editorial board is saying that the ends justify the means and the Star is simply going to ignore the dishonest means used by the proponents of that hospital because, hey what the heck, it is for a good cause. For a newspaper which has publicly declared itself to be a proponent of lobbying and redistricting reform, it is disheartening that the Indianapolis Star has decided to ignore dishonest, bad government tactics of one side when their editors like what that side is trying to achieve. We deserve better from our newspaper, especially one which claims to be on the side of good government reform. Being in favor of a certain result at the polls, does not excuse dishonest election tactics and violations of the law. One of the frustrations voiced by state legislators during the debate over a tax bailout of the Capital Improvement Board was difficult in getting straight numbers from the CIB over its financial situation. The numbers always seemed to be changing. Well, they changed, yet again. Today's Indianapolis Star contains a story suggesting that the financial woes of the CIB are not as great as officials expected. Supposedly things like laying off some low paid workers, reduced energy costs, savings on cell phone bills and travel expenses have allowed for a dramatic cut in expenditures to the tune of $26 million. CIB officials now say they may even be able to avoid borrowing $9 million from the State. One should remember that the legislature made Indianapolis' raising the hotel tax to the highest in the country, a necessary first step to the CIB borrowing the $9 million. The CIB told the Council that it desperately needed the $9 million loan as a reason to support the higher hotel tax. Now that the CIB has the higher hotel tax in place, and two more tax increases on the way, the CIB says they might not need to borrow the $9 million after all. The problem with this debate is few people (and virtually no one in elected office) take a close look at the numbers. Could those cuts made this Summer by the CIB have produced a $26 million savings? Absolutely not. The numbers don't add up. The only valid explanation is that the CIB has not been honest about its budget deficit numbers, inflating them and deflating them as necessary in order to achieve certain goals. What is the incentive behind the current more optimistic view? One only has to look at the article. This November marks the 10 year anniversary for the Pacers contract, the time frame for reopening negotiations with the City on its Conseco Fieldhouse contract. CIB officials have again started talking about picking up the operating costs at Conseco Fieldhouse for the Pacers, an issue the CIB emphatically said was not on the table during the CIB bailout discussions at the Council this summer. To recap, the Pacers bear the cost of running Conseco Fieldhouse but receive 100% of the profits off of the building. What the Simons, the owners of the Pacers want, is for the CIB, i.e. Indianapolis' taxpayers, to pay the operational costs of running the building while they continue to get 100% of the profits. While this would seem like a boneheaded thing to do, the CIB, headed by Bob Grand who represents the Simons and the Pacers, has readily agreed that the taxpayers should pick up these operating expenses. To do so during this cycle would require the CIB going back to the Council and getting its budget changed. Now that the inital 10 year period runs out this November, suddenly the Pacers' gift is back on the table for negotiation. The article this morning, including the better financial picture for the CIB, simply lays the groundwork for the CIB to ask that it be allowed to go forward with giving the Simons milllions more. Earlier this year, I spent some time studying the poorly-written, extremely complicated early termination provision in the Conseco Fieldhouse. I came away with the interpretation that it would only be triggered if: 1) if certain financial thresholds have not been met; 2) the team was being sold; and 3) the team was being moved out of the city. While Pat Early focuses on #1, he overlooks #2 and #3. All three have to be met. He also overlooks the incredible financial penalties that the Pacers would face should they opt to exercise the early out clause. We are talking penalties of probably $165 million the 11th year of the contract (2009-2010) and only decreasing by a $10 million or so every year. The Pacers will never agree to pay the penalty for early termination. The team has no leverage to demand more money. Nonetheless, the CIB if laying the groundwork to ask that the Council have the taxpayers shell out more money to the billionaire Simons family. The cuts this summer were nothing more than a PR move to allow the CIB to claim that now it has taken steps to cut its spending, it can give millions more in taxpayer money away to the Simons.